Now here is an interesting take on the words “Lord of the Rings”, where there is nothing much to do with Tolkien at all and his fantasy universe of Elves, Orcs, and Men. Of course, throw in a Balrog or two, some nifty wizards, and you’ve got quite a fascinating story to tell. 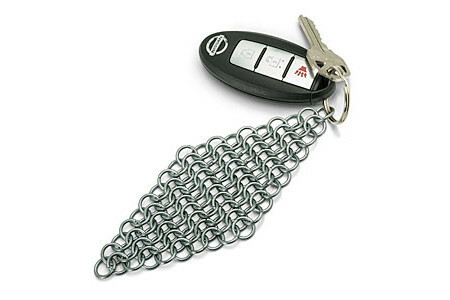 However, the $6.99 Chainmail Keychain comes closest to the movie or book in terms of the mithril armor that Frodo wore, although this is not made out of some mythical metal forged by dwarves in the belly of a mountain, as it is made from zinc-plated steel rings instead, with a split ring for attaching your keys.